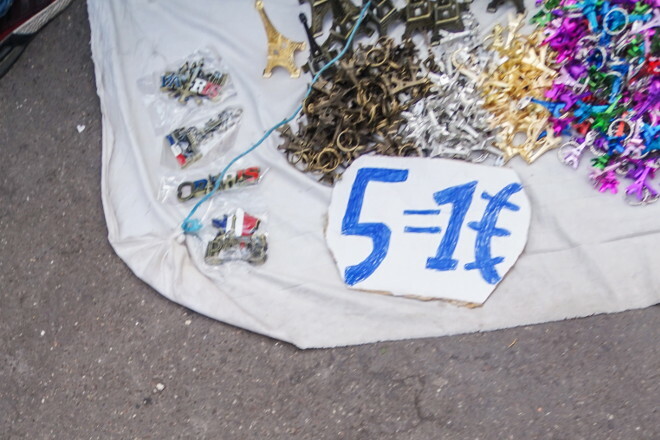 In Paris, many street souvenir vendors have thier stuff laid on the ground and a piece of paper says "5 = 1€". Well, 1€ for 5 souvenirs would be a pretty good price but no, the price is 5€ for 1 piece. Why do they write the price this way? First, customers are "baited" by merchants advertising products or services at a low price, but when customers visit the store, they discover that the advertised goods either are not available or are not as good as expected, or the customers are pressured by sales people to consider similar, but higher-priced, items ("switching"). Here, rather than attempting to steer the customer to different higher-priced items, the seller asserts that the customer has misunderstood the (intentionally confusing) sign and that the items on display are actually more expensive than the customer believed. In this case, the fact that the intended audience is foreign helps, since people may accept the "unfamiliar" manner of writing the price on the assumption that it must be an unfamiliar French convention. As noted in a comment, the practice may be more of a fraud than a bait-and-switch, although I could not readily find any images on the web to support this assertion. The more common way to express a price for several items is, for example, 5€ les 2, as in this image, meaning five euros for two pieces. As noted in another comment to Willeke's answer, the incorrectly-drawn euro sign may also be an intentional mistake to provide a scammer with (not so) "plausible" deniability. It could also help to select more vulnerable people. Willeke's answer also deserves your upvote because it notes that the confusion created by the sign can provide opportunity for pickpockets, whether they are in league with the vendor or not. There are many ways you can write prices with the euro sign, all traditions out of all euro countries are acceptable. The one in the picture seems to indicate a writer who is not familiar with the € sign, using three 'horizontals'. This may also indicate he is not familiar with other parts of the writing traditions in Paris. Or (as noted in comments and other answer) can be on purpose to make a scam easier. With the amount of souvenirs left on that piece of cloth, he will want to sell. He will not want to get in fights will all potential buyers. But it is possible that you have found the one seller that is really dishonest. So be aware that he might try something. Have a one euro coin, or small change to that amount, select 5 items and hold them in one hand while offering the money with the other. If he does not accept, he will tell you the price is different. In that case you drop the souvenirs on his cloth and walk away. In the mean time it is important to keep an eye out for pick-pockets. Not just you but your whole party. They might be part of the same set-up or just looking for easy marks. And by buying anything from one of the sellers, you tell all the others that you are open for deals, so also have your 'no' prepared. On re-reading your question I get the impression you are convinced that all people using this method of writing charge €5 for one item on their cloth. From the photo it is not clear whether the souvenirs are of a size to make that an expected price. If they are, yes then the price is written as a kind of scam and you are well better off not to use this kind of seller. As indicated by @Chris H in a comment to an answer, 5=1€ is a common way to write 5 for 1 euro on the markets of France. Likely the scammers will pretend to be unfamiliar with that practice if asked. I myself have often seen 5/1€ for 5 for one Euro, that I had taken it as the same thing written in a variation. Having been in Paris, I have always used the shops which sell the same kind of souvenirs well away from the main sights, which go for the same price range as the street sellers but without the scamming. They likely still make huge profits on each item but do pay for premises, taxes and staff and do not disturb the public as much. Because they sell more this way. These guys are professional street vendors that try to sell useless junk made in China to naive travelers and tourists for as much money as they can. Intentionally misleading about price up front gives them more sales than being honest, as most people would just walk by when see the actual price for that crap. Once you stop to talk, they can engage (which most of them will do fairly aggressively and skillfully) to sweet talk or pressure you into a sale. It's a scam. It's because 5=1euro sounds way better deal than 5 euro for 1. Then if you try to pay 1 euro, they'll aggressively to make you feel bad, i have starving kids, calling you heartless, cheap, etc. They're outright lying to the tourists, and are scamming them. And whatever you do, if someone offer to tie a friendship string bracelet to your finger, or your wrist: !Don't let them do it! Doesn't matter if the person is telling you: "Don't worry, Be happy!" They'll tie that bracelet in a knot that's impossible to take off, and that string bracelet will set you off 5 euro, 10 euro etc. You should be happy! But also be wise, wary, and yes: worry about how people will try to take advantage of you. An addendum to the other answers: Do you see the blue string going to the edge of the cloth? I'm pretty sure, the other edges are tied as well. So the seller only has to pick up and pull the lines to "close" his shop (and run away). I support the claims this is a scam, as the seller is also prepared for a fast leave. I have been multiple times to Paris and if I remember correctly, the first time I was there I bought 3 for 1€ or so. But I'd expect merchandisers to adjust the price on the person asking. This is common in many places, they'll purposefully set it in a confusing way and then ask for the maximum they think you'd pay. So if you are decisive, take 5 items and give the person there 1€ that'll probably settle it. If you ask, they will tell you either the second or third. If you look unsure, show a bunch of Euro bills, and then ask, they'll very likely ask for the highest price. Offer the best deal you can interpret or walk away otherwise. They'll very likely say yes as you walk away. Not the answer you're looking for? Browse other questions tagged paris price tourist-traps souvenirs or ask your own question. Paying Respects to Holocaust Victims in Paris: Are the Vélodrome d'Hiver & Drancy Camp respectable museums to visit? Are they even museums? Why do people in the Marrakech Medina say “That way is closed”?